The basic settings for the air conditioner can be adjusted via the sound system or MMI*. – Select: Function selector button > control button AC. 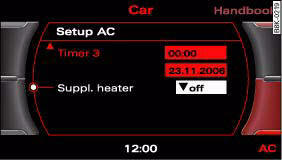 – Set the Supplementary heater to auto or off. Models with a diesel engine are equipped with a supplementary heater to help warm up the interior more quickly. At outside temperatures below about +5 °C the supplementary heater is switched on (and off) automatically when the engine is running, depending on the coolant temperature, the temperature in the vehicle interior and the temperature the heater is set to.